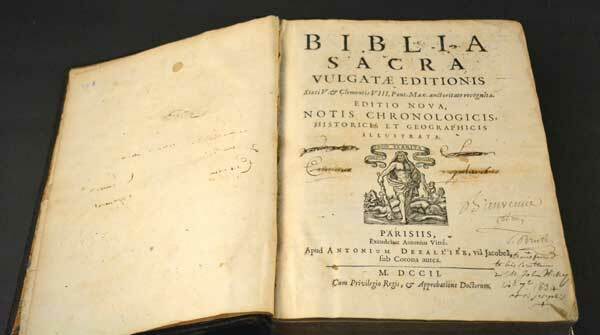 “How much is my old Bible worth?” We get this question a lot about antique Bibles, and though the answer isn’t in black and white, the bottom line is that the value of an old Bible very often depends on condition and rarity. What your old Bible is worth typically revolves around what shape it’s in, its age and whether it is common or uncommon to collectors. 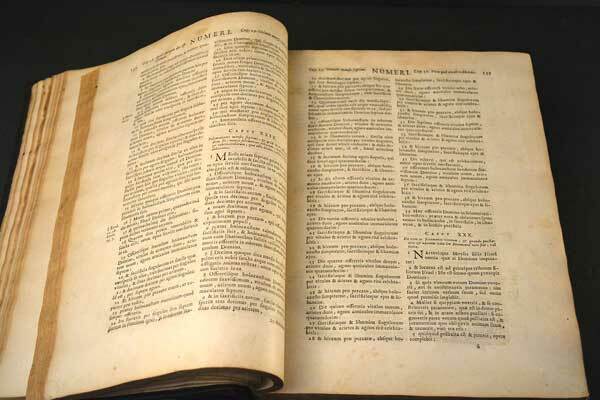 Learn about a few points that will make a difference in the value of your antique Bible. Whatever their title and whatever their age, books were, and are, meant to be read. Just think about how people have used and cherished Bibles through the years. Unless they’re gorgeous display-only works of art, Bibles have typically been heavily used by their owners. In fact, second to antique children’s books, thumbed through by little hands, old Bibles tend to suffer the worst when it comes to their condition. The Bible is not only the single most printed book in history but it’s also the most read. This is primarily why most old Bibles don’t stand the test of time in terms of condition as well as other books which tend to sit on the shelf. Therefore, it stands to reason why condition becomes an important factor in the value of an antique Bible. How rare is my antique Bible? Rarity plays a big part in the worth of an old Bible. In general, a Bible published towards the end of the 19th century almost certainly has little or no value; one of the exceptions is if it is finely bound or has some special characteristic which sets it apart from the crowd. However, the older the Bible, the less important condition becomes. Due to the relative scarcity of antique Bibles in decent condition which are 200+ years old, their value and collectibility rises. For example, even an incomplete King James Bible from 1611 can still be worth a considerable amount. Sometimes, you don’t even need the entire Bible to have great value on your hands. Some individual leaves from rare Bibles can make big money. The Gutenberg, also known as the 42 Line Bible, was the first substantial book printed around 1455 using “moveable type”, and is probably the most famous and sought after antique Bible. In fact, just one page from the Gutenberg Bible could be expected to fetch $100,000 or more! It’s extremely unlikely that any of us have a loose leaf from the original Gutenberg stored up in the attic, but it certainly is mind-blowing to think about the value of just a single page. What makes an old Bible collectible? There are many types of antique Bibles that are collectible for various reasons. Some antique Bibles are collected for their beautiful fine bindings and illustrations. Especially popular are early 15th-17th century Bibles with woodcuts and maps or later steel engravings and chromolithographic printings. Some are presented in wonderful, large vellum clasped folios. Beauty and quality craftsmanship go a long way in adding to desirability, and these are definitely factors to consider when evaluating an old Bible. When we evaluate an antique Bible, these are just a few pointers we look for, combined with years of experience dealing with antique books and access to historic auction records which help judge the interest for certain types of Bibles in the marketplace. Want to sell a rare or antique Bible? We can help evaluate the rarity and condition of your antique Bibles and determine if they have value. Ask us about antique Bibles!